As you're probably aware I'm a just a little bit of a fan of nail varnish and nail art and this means I do tend to get through quite a lot of base coat and top coat. I've tried quite a few different ones now and although I do have my favourites I'm definitely still looking for my holy grails, especially in terms of top coat. Earlier this year I was asked if I'd like to give the eyeCANDY Gel wrap system* a try and of course I said yes. The eyeCANDY Gel wrap system contains a base coat and top coat that are supposed to provide the benefits of a salon gel manicure but without the need for a UV lamp. The base coat contains a formulation of powerful acrylic gel for the natural nail that protects against cracking, peeling and splitting and provides a smooth foundation for nail colour. The fast drying acrylic top coat then seals in colour and should protect against chipping and extend wear time. Even though these both use natural light rather than UV light to dry or 'cure' I was slightly concerned that this might be difficult to remove. Last year I had my first gel manicure, but I then discovered that I'm unable to soak my nails to remove it as this burns the skin around my nails. In the end I just had to peel and chip it off, and even then I couldn't remove it all, and obviously this didn't leave my nails in very good condition. I didn't need to worry about this though as it's no different to removing any other standard nail varnish. There's not a lot to say about the base coat apart from that I liked it. It was easy to apply and dried quickly leaving a smooth surface. 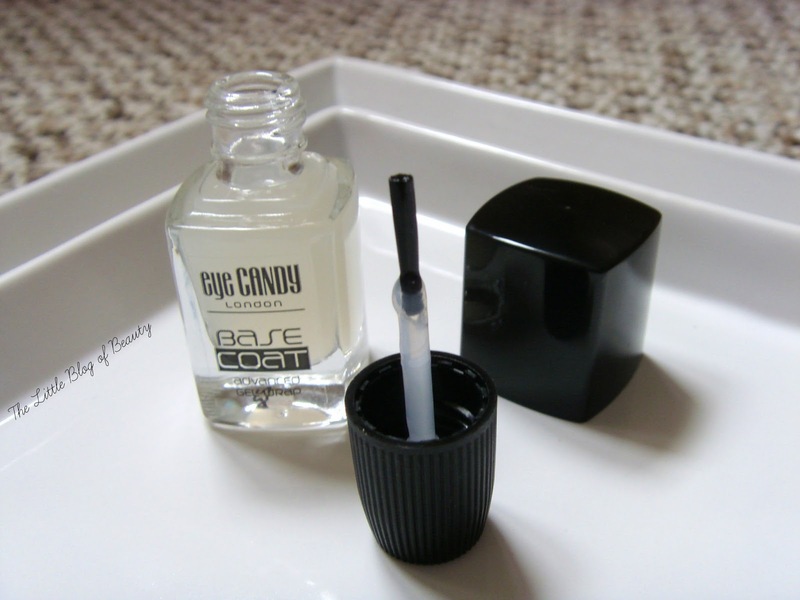 The top coat was also easy to apply and I was pleased to find that it did dry very quickly. It leaves you with a very glossy finish but I didn't find that it provided any kind of plumping effect, but then it doesn't specifically claim to. As for how long this lasts I found that it did prolong the wear time of my nail varnish. As I've mentioned before no matter what nail varnish I use I seem to get chips appearing within a couple of days, often within the first day, but with this I've managed to get up to three days without any chips appearing. If a top coat makes nail varnish last a few days longer on me then it's likely it will work very well for others. 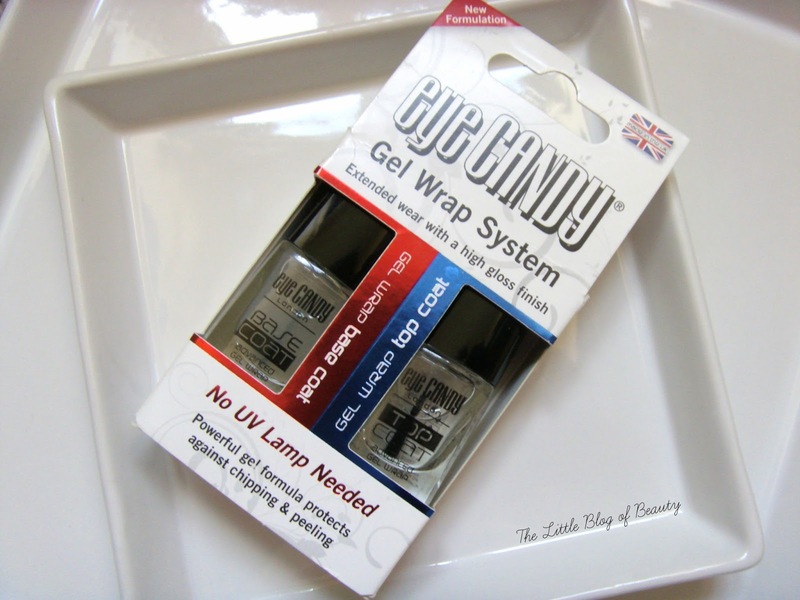 The eyeCANDY Gel wrap system is £10.99 for both the base coat and top coat, which I think is pretty good value when you often have to pay that for just a good quality base or top coat on their own. You can find this on Amazon for £9.68 and it's also available in Tesco stores (I couldn't find it online) and when I spotted it in store recently it was on sale (although I'm afraid I can't remember the price). Do you like the sound of a gel effect manicure without the UV lamp? This did not work for me, but nothing seems to, even gel nails. However, I do use the base coat with my new find nails inc caviar top coat and its lasts me 3 days. First time in my life!!! I think I will try the Sally Hansen kit next. Somebody else told me on Twitter earlier that this didn't work for them either. Normally nothing works for me too so I'm pleased this does appear to give me a few extra days.